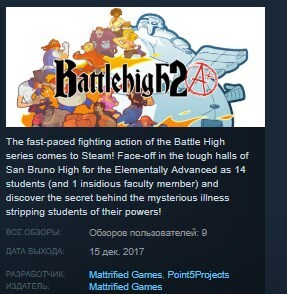 The fast-paced fighting action of the Battle High series comes to Steam with improved graphics, balancing, and "enlightening" newcomers Lucio Marmo and Beat, in Battle High 2 A+! Face-off in the tough halls of San Bruno High for the Elementally Advanced as 14 students (and 1 insidious faculty member) and discover the secret behind the mysterious illness stripping students of their powers! It's a fighting game, what else do you want me to say?